CONGRATULATIONS to our fabulous U14 Real Heat team who completely dominated play all weekend long at Canyon Rim Classic Tournament at Twin Falls. 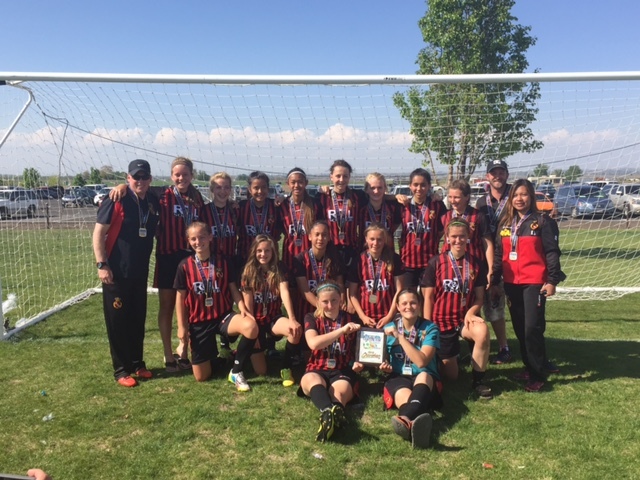 This amazing team finished with the U14 Girls Championship by outscoring their opponent’s 23-3 in four (4) matches. Elizabeth “Lizzy” Gonzalez lead the team’s offensive punch with amazing 13 goals. She lead ALL scorers in the U14 Girl’s Division. Amber “AJ” Carpenter was the defensive anchor by leading her amazing defenders in allowing only 16 shots on-goal the entire tournament. The team as a whole played very well, this group loves adversity, they seemed to step up big time when challenged…every single one of our players contributed in capturing the championship. The coaching staff is incredibly proud of these amazing young ladies who continue to set the bar higher in their quest at capturing State Cup. ← La Liga Basque Soccer Giant Athletic will play in Boise during Jaialdia Festivities!